Developmental disorders affect the development process of some children. They can be of a physical or mental nature. Occurring at any stage, developmental disorders may or may not have lifelong effects. Some of the most common developmental disorders are speech and language disorders, attention deficit disorders also known as ADD, attention deficit hyperactivity disorder known as ADHD which are included in the specific developmental disorders category. Other common developmental disorders are autism, Asperger and Rett syndromes. These pertain to the pervasive developmental disorders category. Research is continually carried out to find better treatments for children and adults alike as some methods are considered controversial as is the case of ADHD. ADHD is a developmental disorder which manifests through lack of attention and hyperactivity occurring on a seemingly random basis. According to statistics, 5% of children are diagnosed as suffering from ADHD worldwide. For 30% to 50% of patients, symptoms continue to appear in the adulthood. ADD is a subtype of ADHD also known as ‘ADHD predominantly inattentive’. The person diagnosed with ADD can be easily distracted, unorganized, forgetful and suffering from constant fatigue. To detect ADHD, doctors analyze the patient’s behavior. If he cannot focus on performing a task from one end to the other or gets distracted by something else while working on his project, he may suffer from a developmental disorder. Other signs include difficulty in understanding the requirements of an assignment, daydreaming or forgetting things. These are the symptoms related to a lack of attention. Where hyperactivity is concerned, a person can talk very much, have trouble in maintaining a seated position for too long, intervene abruptly in conversations and show impatience when they want to achieve something. Symptoms identified for six consecutive months can entitle a doctor to diagnose his patient with ADHD. A person presents ADD symptoms by not paying attention, making careless mistakes, not following through on instructions and by not having the ability to organize things. The ADD candidate also tends to forget things that are useful for school work such as pencils, books and other educational tools. If six or more of these symptoms persist for six months, the person can be diagnosed with ADD. To keep ADHD under control, doctors usually prescribe stimulants like Ritalin, Metadate, Concerta, Dexedrine, Adderall and Desoxyn. They are based on amphetamine substances, therefore caution is advisable to avoid addiction. The medication used for ADHD has shown positive effects in treating ADD. Stimulants like Ritalin and Adderall are the most prescribed. ADHD is a developmental disorder affecting children defined by lack of attention and hyperactivity. 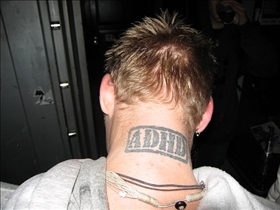 ADD is a subtype of ADHD which manifests through lack of attention. Symptoms for ADHD include difficulty to keep focus on a task, forgetfulness, impatience and constant motion. Symptoms for ADD are lack of attention, disorganized behavior and forgetfulness. Stimulants like Ritalin and Adderall are prescribed to keep ADHD and ADD under control. Which condition requires ultra serious meds?